BonAView is the most innovative digital photo management software which have no analogs in his class. It provides an ultimate image management and organization tools which helps you to categorize and rate your image files, and manage photo collections of any size - from a few hundred to a few millions. BonAView's Viewer window lets you view your digital photos with an easy-to-use intuitive 3D interface. BonAView's image viewer will generate high-quality thumbnails of your images and display them like interactive pictures in 3D space. Here you can navigate, rotate, flip horizontally or vertically your images at one click. It so easy like watching TV. 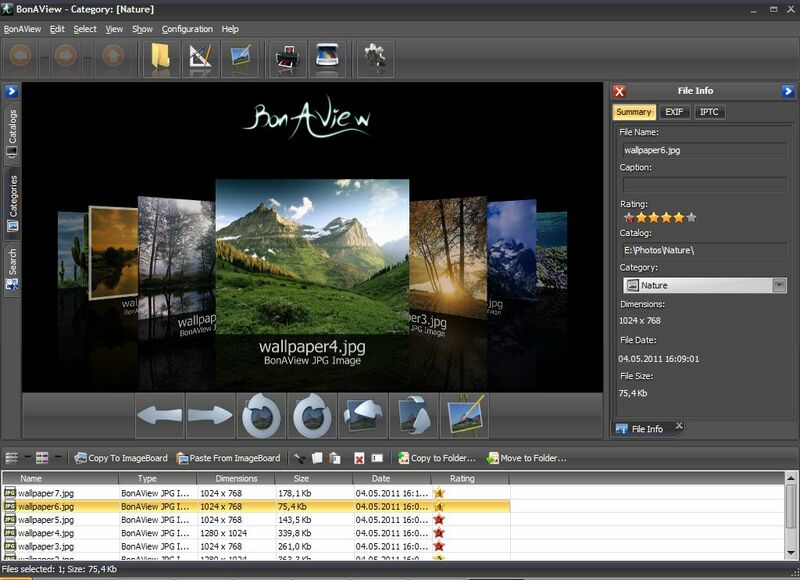 Also, BonAView includes a wide variety of image editing tools you can use to create, and edit your digital images. Use tools such as red-eye reduction, rotation, sharpen, blur, and many others to enhance or correct your images. You can also use a set of automatic enhancement tools which automatically correct the color balance of your photos, that will make your digital images more better. Also, BonAView provides a powerful image searching tool, which will help you to find exactly what you want. With a filtering tool you will reject the waste browse or search results. BonAView Photo Manager is a powerful, easy-to-use, and good-looking image viewing and management system, that will be useful for everyone from beginners to professionals. Changes: + Added ability to change order of albums by drag'n'drop operation. + Added commands to move up/down albums. + Added ability to create automatically albums structure similar to folders structure (just drag'n'drop folders to albums tree). BonAView can be freely distributed over the Internet in an unchanged form. BonAView Setup License ================== IF YOU DOWNLOAD OR USE THIS PROGRAM YOU AGREE TO THESE TERMS. License Agreement and Warranty Disclaimer You should carefully read the following terms and conditions before using this software. Use of this software indicates your acceptance of these terms and conditions.